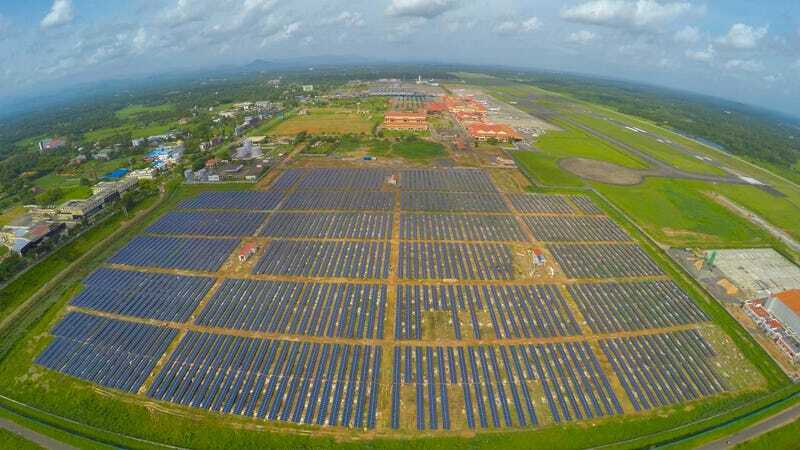 Cochin International in southern India is the world’s first airport to be run solely on power from the sun. It became totally energy self-sufficient in August. How’s it holding up? BBC reports that the 1,300-acre airport harnesses energy from a field of over 46,000 solar panels to run what’s apparently the country’s seventh busiest airport. It produces enough energy to power 10,000 homes for one year. Installing that solar plant took six months and $9.5 million, but apparently, airports from elsewhere in India and even Liberia have expressed interest in copying the model. Everything looks like it’s going great on paper, but the new challenge? CIA wants to open a new international wing in January that will require more energy than the current plant is capable of—which is saying something, because apparently, it’s already operating on a surplus, so that new wing is going to require a boatload of power. It may seem like this infrastructure is already getting too big for its britches, sucking in millions of dollars and trying to keep pace with strict timetables. Apparently, the Indian Prime Minster wants to boost his country’s solar capacity to 100,000 megawatts in the next six years. Still, more than 300 million Indians still aren’t on the power grid, so the sun seems like a cheap, accessible option to fixing that. Using alternative energies in air transportation and operations is becoming more common. Nowadays, big airlines are even toying with biofuels to run their jets: one of those biofuels is algae, that stinky, green scum you’re used to seeing in your goldfish tank. But emerging technologies are really shaping the way planes fly and the way airports run. We’ve previously reported on how international air travel is being changed by new technologies, from robotic staff helping passengers with their bags at airports to high-speed rail that could start connecting far-flung airports to city centers. With Cochin International, we see a daring example of how serious some countries are about getting greener. The BBC also reported that the reason Cochin International (which has been in operations since 1999) wanted to go solar-only was because of massive power bills. It’s encouraging to see emerging markets like India cash in on solar energy, though, despite the clear problems of expanding an expensive, energy-efficient infrastructure in a short period of time. We’ll have to wait and see what happens—not just in India, but in developing nations the world over. Top image via CAL Facebook page. Correction, 12:59 p.m.: The solar energy project cost $9.5 million, not billion.